Do you remember life before kale? Seriously, WHAT was life before kale? An empty meaningless void, like being in an airport without wifi, a series finale, your favorite restaurant updating its menu, Gmail telling you to pick a new password, admitting that your favorite pair of jeans is too worn down and finally throwing them away. In other words, could life before kale really be considered living? Without kale we would be subjected to spinach, chard and lettuce. And it doesn’t really matter if kale is chock-full of vitamins and calcium, if it makes you live longer, feel stronger, may even fix the health care deficit and ultimately save the world. Kale tastes good and that’s why we eat it. Wait, did I just said “we”? Let me rephrase that...that’s why I eat it. Pesto, bite-sized cakes, a casserole, green juice, chips, kale is everywhere in my life. One of the reasons I love kale is because of its texture, which lends to a great variety of ways to work with. Steamed, sauteed, baked, fried, you can’t go wrong with kale. I can’t remember how I stumbled across this recipe, I can only assume I was looking for something related to kale. Or maybe I was looking for a gratin recipe. Or maybe both. Anyways, this is a “great gratin”. Just for fun, try saying "great gratin" 20x fast. Doesn’t it feel like “How much wood would a woodchuck chuck if a woodchuck would chuck wood? A woodchuck would chuck how much a woodchuck would chuck if a woodchuck would chuck wood”? Okay, back to this “great gratin”. It’s great because it’s super easy to make, it tastes amazing, and everyone will love it. Some people may argue that there’s potatoes, heavy cream and cheese, but hey there’s like a ton of super healthy kale. You can definitely indulge this one time. 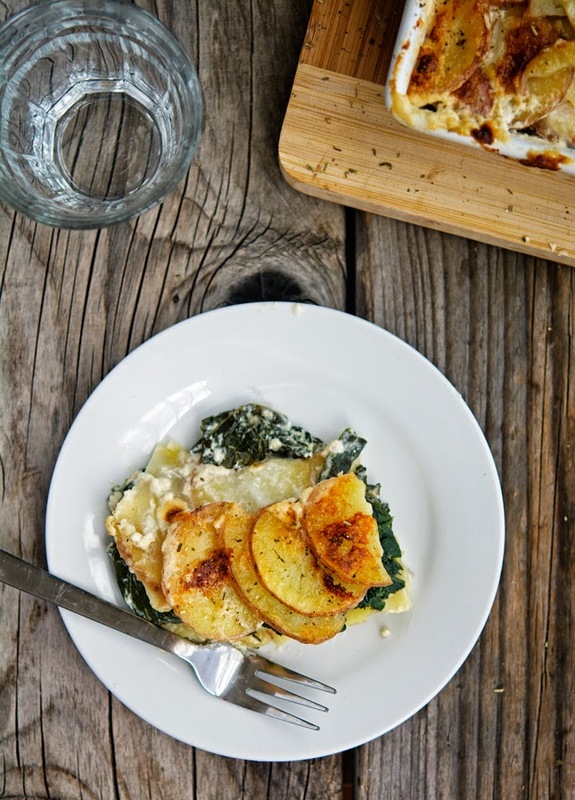 Potato and Kale Gratin Print this recipe! Bring a large pot of water to a boil. Salt the boiling water, and add the kale. Boil for 2-3 minutes, until wilted. Drain in a colander and allow to cool slightly. Squeeze out excess water and set aside. In a bowl whisk together cream, salt, pepper and nutmeg. Set aside. Grease a 9x13 baking dish and place half of the potatoes in an even layer, top with kale, then top kale with half of the Parmesan cheese. Top with remaining potatoes and sprinkle with the rest of the Parmesan cheese. Cover baking dish with aluminum foil and bake for 25 minutes. Remove foil and bake for further 25 minutes, or until the potatoes are tender and the cheese is golden brown. Allow to sit 15 minutes before serving. One serving yields 314 calories, 19 grams of fat, 31 grams of carbs and 10 grams of protein. I'm all about texture too and totally agree with you. This looks incredible Mike. Have a great weekend! Thanks man, have a great weekend yourself! I adore kale too - it sure is versatile and awesome combined with 'taters! Have a wonderful weekend Mike! 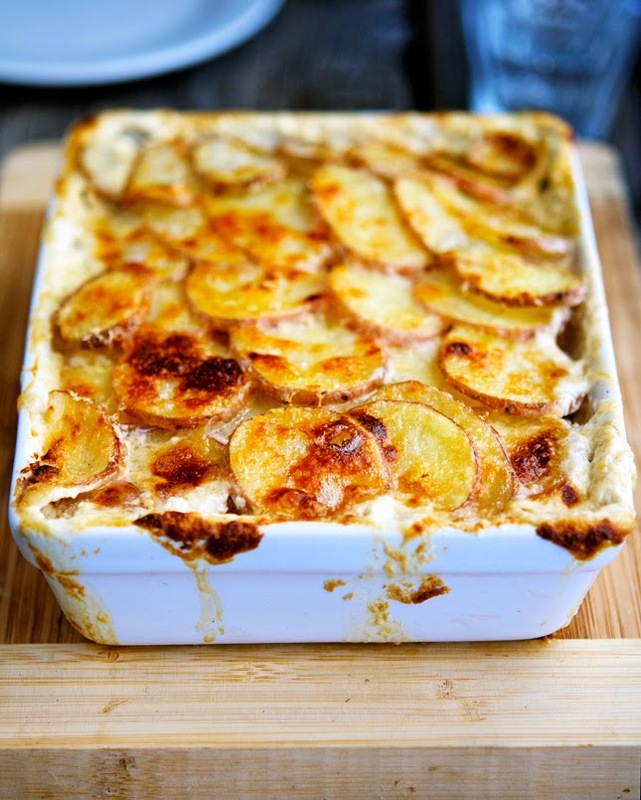 This great gratin Shashi, you should totally give it a try! Wait, what?? You're trying to suggest there was life on planet Earth before kale? No offense, Mike, but you clearly got things wrong. First, there was kale - and the rest is history. Not the actual recipe my grandma would follow but that one's obviously in German. She definitely doesn't use oats in hers so the recipe I linked up minus those would be perfectly paleo-friendly, I think?! Anyways, I'm vegetarian now so your recipe sounds much better. That is actually super-interesting, thank you so much for this comment. That stew sounds amazing (especially your paleo version! ), I just wonder where I can find pinkel sausage 'round here. Some research is definitely needed! If you have any other suggestions using kale, let me know. Thanks you! My husband will thank you later - after I make this! You said is C, "with a glass of red"...AMEN! This looks very good. Your photos are great, they make me hungry . I like the idea of using sweet potatoes. It's awesome both with sweet potatoes and white potatoes, maybe I'll try using both next time! Forget kale, potatoes are where it's at!...and if kale is thrown in for good health measure, so be it. 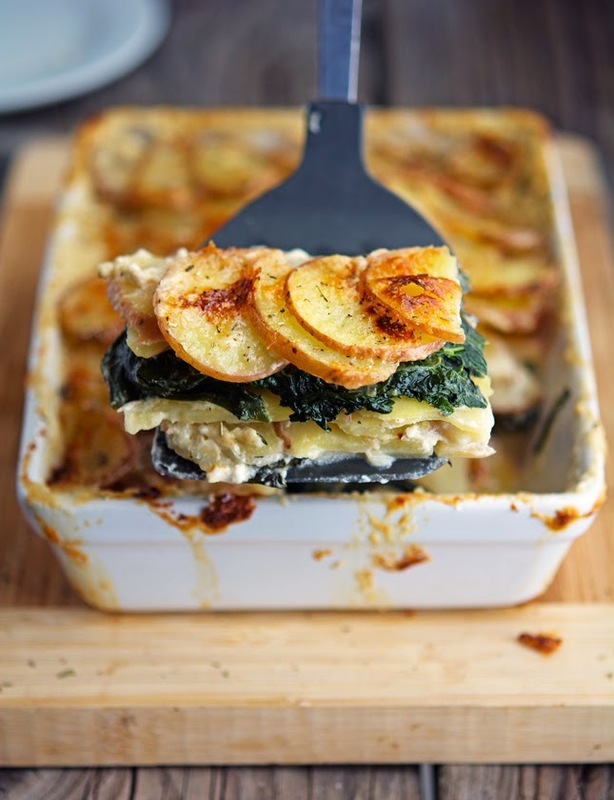 :-D This looks like a great alternative to traditional scalloped potatoes too! You're so right Lauren, this gratin is totally scalloped potatoes with a kale center...should I rebrand it? Mike, we just enjoyed your Skinny Eggplant Parmigiana... WOW! Man, you really did it with that one... I am crossing my fingers that my photos will be blog-worthy so I can brag... rather blog about it. In case your readers might have missed that post, do you mind if I include a link to your past? So, so SO GOOD! I'm so glad you enjoyed my skinny eggplant parmesan, it's super awesome right? Hi Mike, my guilty pleasures are gratins, this looks beautiful! I am a massive gratin fan.. never added kale to mine before though, thanks for the idea Mike! Kale works amazing in gratins, you should totally try it! Reading your post made me hungry. And now I'm a new born kale fan. Pictures, combination of flavors and back ground info are VERY convincing, So kale is on my shopping list for the farmers market this week. You should totally get on board with kale Daniela, it's so good! I've had kale 2 different ways now...kale chips and in a soup. I loved them both and now I am looking forward to trying it this way! Thanks Mike for your great recipes! You raise a good point - I can't remember much about life before kale! :) I almost always put it in my green smoothies, but this looks like a perfectly creamy way to get me out of my kale rut! Looks tasty and some amazing photography. Have you got any details anywhere on what kit/set up you use? This was amazing. I made it several times since initially making Thanksgiving. I thought the kids would pick out the kale...nope! Yum yum slurped it all down and had seconds! Thank you so much.